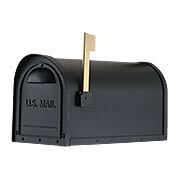 Enhance your curb appeal with one of our decorative post mount mailboxes. 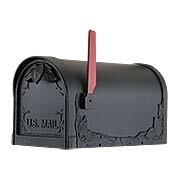 Made of rust-resistant cast aluminum, these residential mailboxes come in an array of style and finish options. 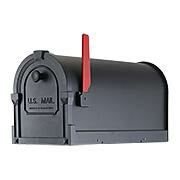 The curbside mailboxes are crafted for long-lasting wear and complement a variety of architectural styles. Our Hummingbird Curbside Mailbox with Ashland Post boosts your curb appeal with its perfect combination of beauty and function. Made of durable, rust-proof aluminum, it features a deeply embossed bird and floral motif, magnetic catch, and an overhang that keeps the interior dry. Each piece is powder coated to give it a chip-proof, fade resistant color adding to its long-lasting wear. 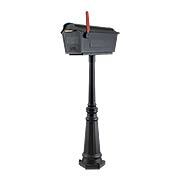 The sturdy, yet elegant post is designed to withstand even the harshest weather conditions. Our Hummingbird Curbside Mailbox boosts your curb appeal with its perfect combination of beauty and function. Made of durable, rust-proof aluminum, it features a deeply embossed bird and floral motif, magnetic catch, and an overhang that keeps the interior dry. Each piece is powder coated to give it a chip-proof, fade resistant color adding to its long-lasting wear. Our Berkshire Curbside Mailbox with Ashland Post boosts your curb appeal with its perfect combination of beauty and function. Made of durable, rust-proof aluminum, it features an impressive face, magnetic catch, and an overhang that keeps the interior dry. Each piece is powder coated to give it a chip-proof, fade resistant color adding to its long-lasting wear. The sturdy, yet elegant post is designed to withstand even the harshest weather conditions. 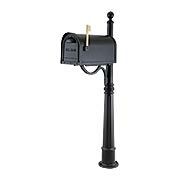 Our Berkshire Curbside Mailbox boosts your curb appeal with its perfect combination of beauty and function. Made of durable, rust-proof aluminum, it features an impressive face, magnetic catch, and an overhang that keeps the interior dry. Each piece is powder coated to give it a chip-proof, fade resistant color adding to its long-lasting wear. 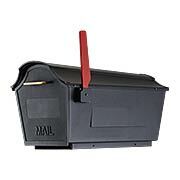 Our Classic Curbside Mailbox with Ashland Post boosts your curb appeal with its perfect combination of beauty and function. Made of durable, rust-proof aluminum, it features a traditional shape, magnetic catch, and an overhang that keeps the interior dry. Each piece is powder coated to give it a chip-proof, fade resistant color adding to its long-lasting wear. The sturdy, yet elegant post is designed to withstand even the harshest weather conditions. 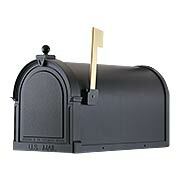 Our Classic Curbside Mailbox boosts your curb appeal with its perfect combination of beauty and function. Made of durable, rust-proof aluminum, it features a traditional shape, magnetic catch, and an overhang that keeps the interior dry. Each piece is powder coated to give it a chip-proof, fade resistant color adding to its long-lasting wear. Our Floral Curbside Mailbox with Ashland Post boosts your curb appeal with its perfect combination of beauty and function. Made of durable, rust-proof aluminum, it features a deeply embossed leafy motif, magnetic catch, and an overhang that keeps the interior dry. Each piece is powder coated to give it a chip-proof, fade resistant color adding to its long-lasting wear. The sturdy, yet elegant post is designed to withstand even the harshest weather conditions. Our Floral Curbside Mailbox boosts your curb appeal with its perfect combination of beauty and function. Made of durable, rust-proof aluminum, it features a deeply embossed leafy motif, magnetic catch, and an overhang that keeps the interior dry. Each piece is powder coated to give it a chip-proof, fade resistant color adding to its long-lasting wear. Our Kingston Curbside Mailbox with Tacoma Post boosts your curb appeal with its perfect combination of beauty and function. Made of durable, rust-proof aluminum, it features a geometric silhouette, magnetic catch, and an overhang that keeps the interior dry. Each piece is powder coated to give it a chip-proof, fade resistant color adding to its long-lasting wear. The sturdy, yet elegant post is designed to withstand even the harshest weather conditions. Our Kingston Curbside Mailbox boosts your curb appeal with its perfect combination of beauty and function. Made of durable, rust-proof aluminum, it features a geometric silhouette, magnetic catch, and an overhang that keeps the interior dry. Each piece is powder coated to give it a chip-proof, fade resistant color adding to its long-lasting wear. Our Savannah Curbside Mailbox with Tacoma Post boosts your curb appeal with its perfect combination of beauty and function. Made of durable, rust-proof aluminum, it features a deeply cut ornate door, magnetic catch, and an overhang that keeps the interior dry. Each piece is powder coated to give it a chip-proof, fade resistant color adding to its long-lasting wear. The sturdy, yet elegant post is designed to withstand even the harshest weather conditions. Our Savannah Curbside Mailbox boosts your curb appeal with its perfect combination of beauty and function. 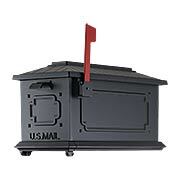 Made of durable, rust-proof aluminum, it features a deeply cut ornate door, magnetic catch, and an overhang that keeps the interior dry. Each piece is powder coated to give it a chip-proof, fade resistant color adding to its long-lasting wear. 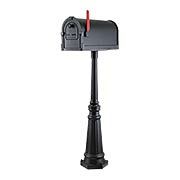 Our Town Square Curbside Mailbox with Tacoma Post boosts your curb appeal with its perfect combination of beauty and function. Made of durable, rust-proof aluminum, it features a sleek stature, magnetic catch, and an overhang that keeps the interior dry. Each piece is powder coated to give it a chip-proof, fade resistant color adding to its long-lasting wear. The sturdy, yet elegant post is designed to withstand even the harshest weather conditions. 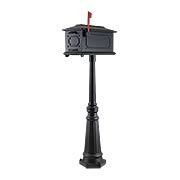 Our Town Square Curbside Mailbox boosts your curb appeal with its perfect combination of beauty and function. Made of durable, rust-proof aluminum, it features a sleek stature, magnetic catch, and an overhang that keeps the interior dry. Each piece is powder coated to give it a chip-proof, fade resistant color adding to its long-lasting wear.